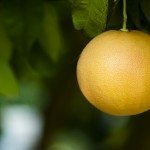 If grapefruits are removed from the branches of the tree before they are ripened, will they ripen enough to eat? How long will this take and how green can the fruit be when it is removed from the tree? Most citrus fruits, especially grapefruit, do not ripen once they are picked. In fact, grapefruits are best left on the tree awhile, as they will become sweeter. Grapefruit harvesting takes place in fall. When the fruits are yellow or golden in color, then they are ready for harvesting.